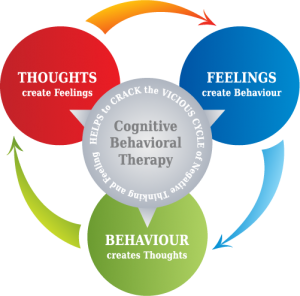 What is cognitive behavioural therapy – or CBT as it’s commonly known? A lot of people think that CBT is ‘just’ about turning negative thoughts into positive thoughts. In actual fact, this element is just one part of a complex – but often life-changing – therapy process. Cognitive behavioural therapy is about understanding the patterns people are in – and reversing them. It is a practical type of therapy, which helps you to manage your problems by changing the way you think, feel and behave. It is also a collaborative therapy. Which means that you work with a therapist to understand the unhelpful patterns that you find yourself in. You work towards establishing more helpful patterns of thinking – in order to improve your quality of life. 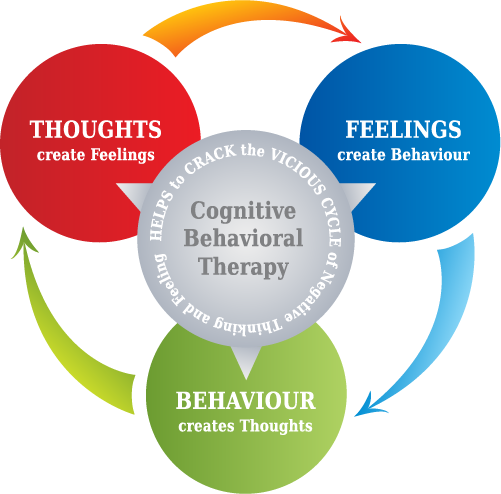 A key concept of CBT is that your thoughts, feelings, physical sensations and behaviours are all interconnected and can trap you into a vicious cycle. CBT helps you to break this cycle and to deal with overwhelming problems in a more positive way. CBT focuses on improving things in the here and now. It doesn’t focus too much on issues from your past, although sometimes our current difficulties do stem from previous events, which then need to be discussed. Think about a recent problem you have experienced and then consider the CBT model, what were your thoughts, feelings and behaviours and how helpful were they? Now take a moment to consider what you are like when you are at your very best without fear or anxiety and now consider the model again does it look different? Importantly, CBT is grounded in a huge amount of research. This means that the techniques used by your therapist have been tried and tested. CBT therapists, like myself, are highly trained and well equipped to work with clients who have the full range of anxiety disorders, mood difficulties and many other psychological issues. A CBT therapist is a lot more active in therapy sessions compared with other types of therapies. This is because the therapeutic relationship is based on the individual being an expert in their experiences and the therapist being an expert in CBT – and bringing these two elements together to solve problems. CBT sessions contain a lot of education about how the mind works and ultimately it will help you to learn and develop the knowledge and skills needed to become your own therapist and make changes for life. To find a therapist you can search online through the BABCP website, speak with your general practitioner or get in touch with me.